NBA San Diego Clippers AT&TCenterbkpyramid80, 2"
Over 1 lb of crystal. 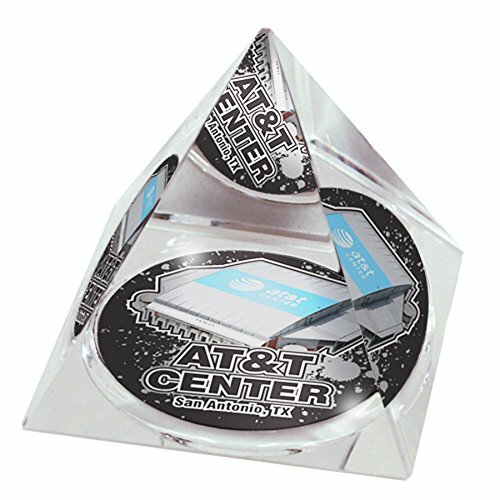 A 4 color image of AT&T center, home of the San Antonio spurs, is affixed to a 3.25 inch crystal pyramid paperweight. The colors are extremely vivid. This paperweight is entirely crafted in USA, out of K9 quality, optical grade crystal, the highest quality of crystal in the collectible industry. The pyramid gives a kaleidoscope effect. Gold color jewelry case included. Manufacturer: Ike and Zelda, Inc. Publisher: Ike and Zelda, Inc. Studio: Ike and Zelda, Inc. If you have any questions about this product by Forever Crystal, contact us by completing and submitting the form below. If you are looking for a specif part number, please include it with your message. NBA San Antonio Spurs AT&TCenterbkppw80, 3"
NBA San Antonio Spurs Amwaybkpy80, 2"
NBA Milwaukee Bucks Crystal Paper Weight, 3"